From our beginnings in Eden, we have been juxtaposed between two competing realities. The higher and ultimate reality is the Word of God while the lesser is the world perceived by the limited, natural man. Our struggle occurs when the “world of the senses” contradicts the “world of the Word.” How are we to respond when these two worlds clash? 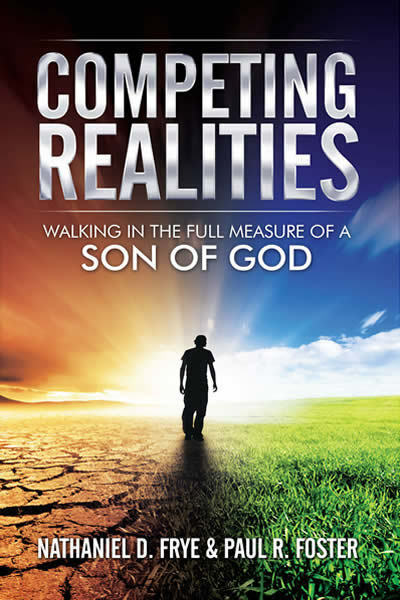 Competing Realities is a guidebook to walking in the full measure of our potential as modeled by Christ. Competing Realities answers these and many more questions regarding the believer’s identity and overcoming life’s challenges. Nathaniel and Paul have provided a guidebook to walking in the full measure of our potential as modeled by Christ. Be empowered to be “in the world,” but not “of the world”. Learn how to advance the Kingdom of God on the earth. Rediscover the Words of Christ when He commissioned believers to the greatest initiative of all. Be reminded of the incredible, supernatural equipment given to those called to be overcomers with Christ. As a battalion is inspired by its commander, receive an ultimatum that leaves no room for mediocrity. Be freshly commissioned to “Go!” and break the orbit of the natural and exercise dominion in a higher reality with Christ.